As world leaders gathered in Turtle Bay, New York, for the annual United Nations General Assembly convergence, there was no shortage of international crises to address. The nuclear issues with North Korea and Iran rightfully dominated President Trump's first speech before the UN gathering, however, Middle East challenges tend to present themselves regardless of the American political calendar or presidential preferences. Surely, there must be a bumper sticker somewhere that reads, "The Middle East Happens." And it does. The Middle East happens whether the U.S. is prepared or not, and quite often independent of any American action. 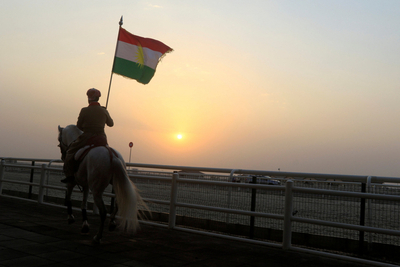 One such fast-approaching issue is the vote on Kurdish statehood. On September 25, the semi-autonomous Kurdistan Region of Iraq, will hold a referendum. The question on the ballot: "Do you want the Kurdistan region and the Kurdistani areas outside the region's administration to become an independent state?" The vote will create a mandate to gain international backing for a negotiated exit from Iraq, presumably within the next decade. Call it a "Kexit," like the UK vote to Brexit from the European Union. For the United States, the issue is about more than Kurdish independence in Iraq; it's about how the United States sees the future of the Middle East and its own relations with a range of nation states, 193 of whom are represented at the UN. Increasingly, it also means that the Trump administration needs to have an overall vision of America's regional objectives that will serve to guide the fashioning of a comprehensive Middle East strategy. That plan, in turn, will better inform Team Trump's tactical choices along the way. For the time being, the Trump administration has joined most regional players in opposing the referendum. The State Department said in June that it was concerned the referendum would distract from "more urgent priorities," such as the defeat of ISIS. State Department Spokesperson Heather Nauert went further in an August 15 press briefing, expressing "very serious concerns" about the vote even if it is considered to be unbinding. She reaffirmed the department's position that the United States wants "a stable, secure and unified Iraq" and, referring to the referendum, urged the Kurds, "Let's not take our eye off the ball. Let's not take our eye off of ISIS." Of course, it could be assumed that if one is a Kurdish Iraqi "the ball" is, in fact, independence, not ISIS, whose rise came in large part as a result of the failure of the Iraqi central government to which the State Department appears wedded. U.S. Special Presidential Envoy to Counter ISIS—and Obama holdover—Brett McGurk was even more blunt in a September 14 press conference in Erbil, asserting that "there is no international support for the referendum, really, from anybody." He described it as "ill-timed and ill-advised" and "risky." Despite Washington's official objections, there is a precedent for such an initiative. The Kurdistan Region of Iraq has been autonomous since the end of 1991, which is when Saddam Hussein's forces withdrew following the Gulf War. Since then, the Kurds, under the Kurdistan Regional Government, have created independent institutions including a parliament, various ministries and armed forces. Until the U.S.-led invasion in 2003, they even had their own currency and received nearly a fifth of Iraq's oil revenue under a deal administered by the UN. Aside from those living today in northern Iraq, ethnic Kurds in general have a compelling case for self-determination. Today, they number around thirty million to forty million people inhabiting the border regions of Turkey, Syria, Iraq, Iran and Armenia. As a distinct community, the Kurds were once finalists in the statehood sweepstakes following the defeat of the Ottoman Empire in World War I. In the 1920 Treaty of Sèvres, they were slated for the creation of an independent "Kurdistan," but then they were then snubbed by the Western, colonial powers (primarily Britain and France), in the 1923 Treaty of Lausanne. That agreement created the borders of modern Turkey and drew new lines in the region with little regard for its inhabitants. Despite their numbers, the Kurds are minorities today in each of their respective countries and most attempts at autonomy, let alone independent statehood, have been crushed by their hosts. No country, however, is more against the initiative or any form of Kurdish self-determination—no matter the size, scope, or location—than Turkey, which borders the Kurdish population centers in Iran, Iraq and Syria. That is because the Kurdistan's Worker's Party (PKK), the Marxist-Leninist group, has waged a thirty-year insurgency inside Turkey and has enjoyed safe havens inside Kurdistan Regional Government-controlled areas in Iraq. About sixteen million Kurds account for 20 percent of Turkey's population. After years of working towards cross purposes in Syria, the Obama administration forged a partnership with the Kurdish People's Protection Units (YPG) in Syria, much to Turkey's chagrin. Identified as the most capable fighting force aligned against ISIS, the United States dispatched a contingent of fifty special operators to help train and support the YPG in October 2015. Crucially, the YPG met Team Obama's criteria for external support, namely, they weren't simultaneously dedicated to toppling the Assad regime. From this effort, the Syrian Democratic Forces were born with the inclusion of some Sunni Arab militias. Although seen as an ally in Washington, the YPG is considered an enemy in Ankara because of their affiliation with the PKK. With the Trump administration expanding Obama's anti-ISIS campaign in Syria and Iraq, friction between the United States and Turkey has gone from a mild irritant to painful chaffing. The difficulty facing policymakers and analysts alike is that although Turkish behavior under the presidency of Recep Tayyip Erdoğan has been a problem, the country is still a NATO ally and is destined to play a major role in shaping the region's future by dint of history and geography. It brings into focus several questions that the Trump administration needs to consider and whose answers will impact far more than the issue of Kurdish independence. First, can the U.S.-Turkey relationship be restored to a level where a meaningful diplomatic relationship can be built based on a common set of interests? That is, after all, the benchmark the president used in his highly anticipated speech in Riyadh in May. Or, is Erdoğan's drift toward Islamism, repression and authoritarianism at home—and his misguided adventurism abroad—simply the rule today and not an exception? Put another way, is reaching an accommodation with Turkey possible, and if so, is it worth the trouble? On the other side of the coin, would Kurdish independence and a long-term partnership benefit the United States? Can the United States create long-term military bases in Kurdish territory to address Middle East challenges? Are they a more natural fit as regional allies, even if it would present a problem for America's other Sunni partners? Another question is how much do the colonial Middle East borders matter to the security of the region—especially when it comes to Iraq and Syria? Both are failed states and the border between the two has become as meaningless as the frontier between Syria and Lebanon. Why should the United States be dedicated to preserving the unity of Iraq or the Syrian state if Syria will be run by Bashar al-Assad, which basically means that it will be another territory under Iran's control? To answer these related questions requires a comprehensive American strategy for the Middle East. President Trump already identified the defeat of ISIS and pushing back on Iran as his key regional objectives. While he has largely succeeded in the territorial defeat of the first, his plan to curtail the second has yet to be formulated, much less adopted. With Iran, American actions have so far been tactical, not strategic. Sure, launching Tomahawk missiles at a Syrian air base sent a dramatic and forceful message to Assad and his patrons, but hitting the ball out of the park once doesn't make one the Hank Aaron of Middle East strategy. It was more like an announcement that the American roster has changed; it can swing the bat well, and the dugout swagger is intended to project strength across the baseline. In this context, viewing the Turkey-Kurdish issue through an Iranian prism, who will make a more effective long-term ally against Iran? Pushing back on Iran and effectively addressing the deficiencies of the nuclear deal should be Team Trump's chief Middle East focus. It is Iran, not ISIS, that presents the far greater long-term strategic threat to the United States and its allies. America's ability to achieve that aim will be shaped by Donald Trump's foreign-policy ideology. Many of those who were behind the idea of "principled realism" have departed the administration (or have been given the proverbial boot) since he first articulated the broad strokes of what that phrase means in action. Trump may not want to tempt the Pottery Barn "you break it, you own it" rule because it's a slippery slope towards nation building. That could explain his hands-off approach to Syria, which is where many of the region's challenges intersect. But without active American leadership and crisis management, the region defaults to open conflict and war—fertile ground for the rise of terrorists amidst chemical and biological weapons, with the added danger of nuclear proliferation presented by the Iranian challenge. A Middle East foreign policy designed to return Syria and Iraq to pre-2011 conditions will simply reset the circumstances that were the root cause of the Arab upheaval. Even worse, it leaves the two countries under Iran's control and hands the regime in Tehran the strategic prize it has sought since the 1979 revolution. As the old saying goes, "you may not be interested in war, but war is interested in you." The same can be said about U.S. interests in the Middle East. Likewise, the Trump administration may not yet have a strategy to handle Iran or deal with its expansion in Syria and Iraq, but Iran does, and it is implementing that plan. What that means for the current Kurdish question and American policymakers is that at the very least, Washington should realize that Syria and Iraq are already failed states. Why should the Kurdish people of Iraq trust the central government if the Sunni Arabs in the western Anbar province don't trust it? In Syria, hopefully Team Trump understands there is a reason that America's Kurdish YPG allies were dedicated to the defeat of ISIS but not the downfall of Assad: It is because they are willing to cut a deal with the Syrian dictator, especially if they have no other options. Abandoning them after the defeat of ISIS in Syria will turn that territory over to Assad. Effectively, that means substituting the Islamic Republic of Iran in place of the Islamic State.